Single vehicle run-off-road (SVROR) crashes are the largest type of fatal passenger vehicle crash in the US (NCHRP 500 2003). 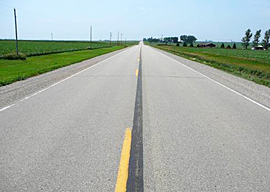 In Iowa, ROR crashes accounted for 36% of rural crashes and 9% of total crashes in 2006. Run-off-road crashes accounted for more than 61.8% of rural fatal crashes and 32.6% of total fatal crashes in Iowa in 2006. The research described in this report evaluates the effectiveness of paved shoulders. Generalized linear models were used to investigate the relationship between crash reduction and implementation of paved shoulders. The response variable was quarterly crash frequency. Separate models were developed for cross-centerline crashes, run-off-road crashes, and single vehicle run-off-road crashes. The model for each independent variable considered over-dispersion and excess zeroes. The best fit model for total crashes per quarter was a zero inflated negative binomial model. Model results indicated that the total amount of right shoulder, presence of a median, speed limit, addition of a paved shoulder and years after addition of a paved shoulder were statistically significant. The effect of paved shoulder varied over time depending on the years after treatment. At 10 years, the decrease is total crashes due to paved shoulders was 15.9%. A negative binominal model was the best fit model for cross-centerline crashes and the model indicated that effect of paved shoulders was not statistically significant. ROR crashes were modeledassuming the distribution of the response variable is a mixture of Poisson and zeros (ZIP). The amount of total right shoulder available, presence of a divided median, speed limit and years after paved shoulders were installed were all statistically significant. The effect of paved shoulder on run-off-road crashes by quarter varied over time depending on the years after treatment. At 10 years, sites with paved shoulders have 13.5% fewer ROR crashes than control sites. Single vehicle run-off-road crashes were modeledassuming the distribution of the response variable is a mixture of Poisson and zeros. The total amount of right shoulder available, presence of a divided median, speed limit and years after paved shoulders were installed were all statistically significant. The effect of paved shoulder on single vehicle run-off-road crashes by quarter varied over time depending on the years after treatment. At 10 years, SVROR crashes are 16.4% lower for sections with paved shoulders than for sites with no treatment.